It’s the oldest and simplest formula for accumulating wealth: Live the “buy low, sell high” dream by acquiring, holding, and then selling property at a tidy profit. Unfortunately, resulting capital gains taxes could amount to persistent leaks from an investor’s wealth-building pool. Every sale of investment or business property can create tax liability, reducing the amount of money available for acquiring new property in the old property’s place. Fortunately, those leaks can be plugged by using a tax deferral strategy known as a Like-Kind Exchange. Serious investors have effectively utilized this strategy for decades, but the rules of the game changed dramatically when the new tax law was passed in December 2017. The IRS recognized long ago that assessing capital gains taxes on every sale of business or investment property created disincentives for growth. After some tinkering with possible fixes, the agency eventually established rules for tax-deferred “like-kind” exchanges under Section 1031 of the Internal Revenue Code. The most basic form of like-kind exchange is a direct, simultaneous swap of properties between two individuals or companies. Such trades are extremely rare, since they only occur when each participant wants exactly what the other wishes to give up. The exchange transaction can take multiple forms, as explained below. 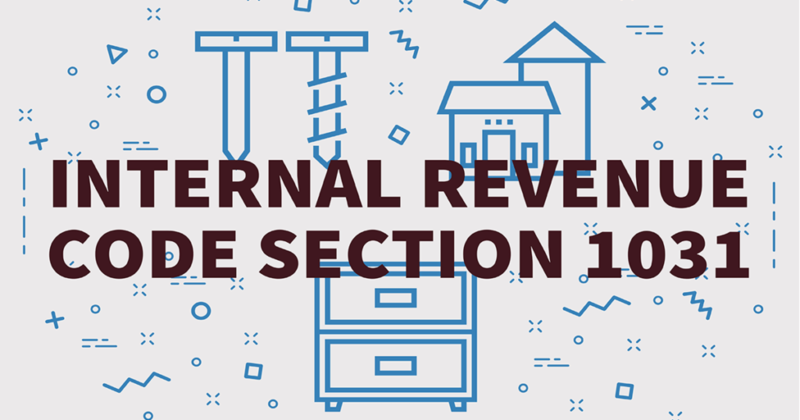 Note that a Section 1031 exchange is a tax-deferral technique, not a tax-free transaction. Nevertheless, deferring taxes on as many assets as possible for as long as possible remains a savvy investment strategy. Prior to the Tax Cuts and Jobs Act of 2017, a wide variety of property types qualified for like-kind exchanges, including machinery, real estate, vehicles, musical instruments, artwork, businesses, cryptocurrencies, and livestock. In fact, as I noted in a previous article on the effects of the new tax law on the sports industry, even professional sports player trades qualified. The main limitation on exchanges was, in most cases, the rather strict definition of “like kind.” A boat could not be exchanged for a van, for example, even though both were vehicles. Most Section 1031 exchanges met their demise when the Tax Cuts and Jobs Act was enacted. Only real estate like-kind exchanges are allowed under the new law. The good news is that the definition of “like kind” remains very broad for real estate. Almost any two properties—a vacant lot and beach house, for example, or an office building and a set of three duplexes—can qualify as like-kind as long as they have comparable values and both are rental, investment, or business properties. Personal real estate, such as a taxpayer’s residence or vacation house, generally doesn’t qualify for like-kind exchanges. With a few exceptions, 1031 exchanges require the involvement of a Qualified Intermediary (QI), also called an Accommodator. Only Nevada licenses QIs. In all other states, it is crucial to thoroughly vet any potential QI, making sure to choose someone with integrity, extensive experience, and knowledge of Section 1031 rules. An exchanger’s relative cannot serve as the QI, nor can anyone with an existing or recent financial relationship with the exchanger. There are four main ways to execute a real estate like-kind exchange, each with its own rules. For a transaction to qualify as a simultaneous exchange, the sale of the relinquished property and the purchase of the replacement property must close on the same day. This of course occurs with a direct swap, and can also sometimes be arranged with the help of a QI who manages the transaction timetable. In a forward exchange—the very kind of transaction Starker famously executed—the exchanger first sells the relinquished property, then seeks out and purchases the replacement property. Once all arrangements for the initial sale have been made, the QI executes the sale and places all proceeds in a binding trust. After the sale, the exchanger has 45 days (the identification period) to identify potential replacement properties in a written document submitted to the QI. Generally, up to three properties of comparable value to the relinquished property may be selected, although other arrangements are possible. The exchanger then has up to 135 additional days (the purchase period) to reach a purchase agreement on one of the identified properties, at which point the QI executes the purchase and transfers ownership of the replacement property to the exchanger. The total time period allowed (45 + 135 days) is known as the 180-day exchange period. If qualifying like-kind properties are not identified within 45 days, if the replacement property is not acquired within a total of 180 days, or if the property purchased differs from the one identified in writing at the 45-day mark, then the transaction does not qualify for Section 1031 tax deferral. In a reverse exchange, the replacement property is identified and acquired first, then the relinquished property is sold. To keep a reverse exchange clean, the QI must handle the purchase of the replacement property and must hold that property beyond the taxpayer’s reach until the exchange is completed. To comply with this arm’s-length standard, the QI usually creates a single-member LLC and transfers the title to that entity, known as an Exchange Accommodation Titleholder (EAT). Once the purchase of the replacement property is executed, the exchanger has 45 days to identify the property that will be sold as the relinquished property, and 135 additional days to execute the sale. Improvement exchanges have particular appeal for anyone who both invests in and develops or rehabilitates properties, but such exchanges are tricky to execute and should be undertaken only with guidance from an experienced tax and investment professional. The basic idea is that after selling the relinquished property, the exchanger identifies a potential replacement property with significantly lower value (for example, a vacant lot or a dilapidated townhouse complex). During the exchange period, the investor oversees construction upon or improvements to the property. By the end of the 180-day period, any value added to the replacement property (in the form of new structures, improvements, or down payments toward the same) must be sufficient to qualify the property for a like-kind exchange. Throughout this process, the title to the replacement property must be held by the EAT established by the QI. Now you know why conversion of a hotel after it is sold happens so quickly! Note that it is perfectly okay to engage in construction or improvement activities with a replacement property that already has comparable value to the relinquished property. The difference lies in the order of the steps: For replacement property of sufficient existing value to qualify for a like-kind exchange, the investor should only begin building or making improvements after completing the Section 1031 transaction. For replacement property initially of lesser value, improvements must be made before completing the exchange. An important limitation to be aware of is that the 1031 exchange rules were developed for business and investment property. The underlying assumption is that the replacement property is acquired either for productive use within a trade or business, or with the intention to hold the property for a considerable period for investment purposes. Therefore, property “flipping” usually does not qualify for the Section 1031 tax deferral. If the IRS determines that the taxpayer’s purpose in purchasing a property was to sell it at a profit (“intent to flip”), the transaction will likely fail to qualify as a 1031 exchange. Although the Section 1031 rules allow only for tax deferral, two creative strategies may enable a taxpayer to permanently shield property exchanges from tax liability. The first strategy is known in the wealth management business by the grim phrase “defer, defer, die.” With a well-structured estate plan, properties acquired via like-kind exchanges can be passed along to an investor’s heirs in such a way that the heirs receive a stepped-up tax basis in the properties. That basis—usually equal to the market value of the properties at the time of the original investor’s death—allows heirs to sell the properties without capital gains tax implications. The second strategy allows an investor to sell off a Section 1031 replacement property tax-free while he or she is still alive. The strategy involves converting a 1031 exchange replacement property into one’s primary residence. Suppose, for example, that a married couple owns a lakefront cabin that they originally purchased as part of a like-kind exchange in 2009 and now manage as a vacation rental. The couple decides to sell their home and convert the rental property into their primary residence. Section 121 of the Revenue Code allows homeowners who have owned a primary residence for at least five years and lived in it for at least two to exclude a portion of the gain from selling the residence (up to $250,000 for individuals, or $500,000 for married couples filing jointly) from their reported capital gains. As a result, the couple may be able to sell their current residence with no tax implications. After moving to the cabin and living there for two years, they can sell that property and shield the revenue from capital gains taxes under Section 121 as well. In the end, taxes on the original capital gain from the sale of the relinquished property way back in 2009, once deferred, completely vanish. Note that employing this strategy may require proving to the IRS that the replacement property (the lakefront cabin in this example) was in fact purchased as an investment holding, not with the intention to live there. Accordingly, certain safe harbor requirements must be met in order to avoid invalidating the prior tax-deferred exchange and allow exclusion of the gain as noted above. Keep thorough records and consult with a knowledgeable tax and investment advisor to make sure all documentation requirements are met. Used wisely, Section 1031 like-kind exchanges are a powerful tax-deferment tool for business entities and real estate investors. Under the new tax law, no comparable tax deferral method exists for other investment types—a strong argument for making real estate a centerpiece of your long-term wealth management planning.